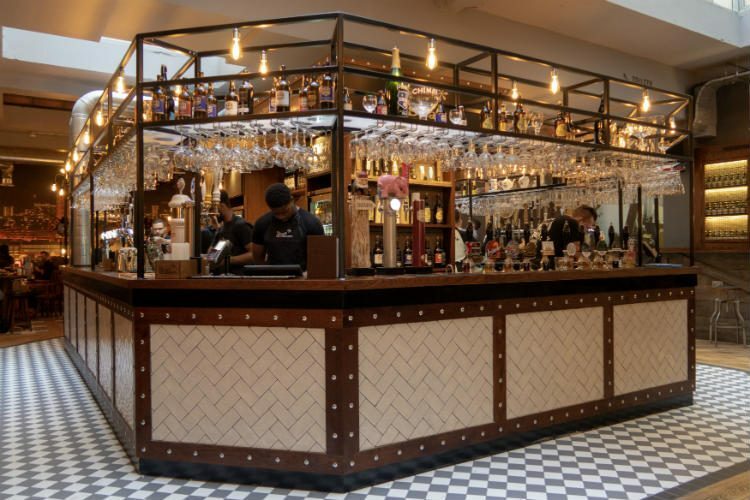 Take a look around the Head of Steam in Birmingham City Centre, where you’ll find a perfect match of beer and food. Over the last year or so, I’ve really enjoyed learning more about beer. Twelve months ago, I didn’t really have any preferences beyond ‘well chilled lager’, but now I’ve picked up a little knowledge about how it’s made and what types I prefer. So when Head of Steam invited me to the preview evening for their new Birmingham bar, I knew this was an event that I couldn’t miss! Head of Steam is a group of bars located in cities across England. The Birmingham bar sits on Temple Row, just a few minutes walk from New Street Station. They are open from mid-morning for brunch every day, and they’re even dog-friendly so there’s no need for your pooch to miss out! The menu features food from all around the world, matched by a fantastic range of beers. The beers on offer include cask ales and craft beers, and there’s a wide range to suit all tastes. After placing our order at the bar, I took a quick look around the venue. As you walk through the door of the Head of Steam, you are greeted by this huge railway-inspired mural. That gives you a good idea of the theme of the bar! The rest of the room continues this theme, with an industrial appearance and booths which look like train carriages. I love the slightly steampunk style of the bar area that you can see at the top of the page, and this gorgeous lighting display in the entrance hall. While we waited for our starters to arrive, Mark and I sampled our first beers of the evening. I’d been told to put the bar staff to the test, and they cleared this first hurdle with flying colours! I had said that I like German lager, and wanted something along those lines. I was presented with a pint of Hell ‘Das Blaue’, which was one of the draught beers served at the Head of Steam. The draught beers will change regularly, so it’s worth checking out what they have on tap when you visit. My glass of ‘Das Blaue’ was exactly what I’d asked for – crisp and dry with plenty of hops and a lovely creamy head. Apparently it’s been brewed for several hundred years, and I can definitely see why it’s still so popular. Meanwhile I’d requested an alcohol-free lager for Mark, as he would be driving us home at the end of the evening. The bottle of Jupiler 0% selected for him was another success, with Mark saying that it’s probably the best alcohol-free beer he’s tried so far. It’s one of only two alcohol-free bottled beers on the menu currently, but this Belgian beer tastes very similar to a standard lager. It’s good to see that the designated drivers can still enjoy a great-tasting beer at the Head of Steam. We’d opted to share three different dishes from the Light Bites menu as our first course, and they soon arrived at our table. First up was a dish of Tempura Vegetables, delightfully crunchy and coated in a light, crisp batter. A bowl of sweet sticky Teriyaki sauce was served alongside for dipping. As you can see, the portion size was quite generous. To be honest, two of these dishes would have been enough for us to share! Our second choice was the Persian Pressed Chicken, which was served with lightly toasted ciabatta slices, dressed salad and a sticky onion chutney. I really enjoyed this, although I would have preferred the ciabatta to have been toasted a little more. It was very fresh and soft and I felt it needed to be a bit more substantial. Mark felt that this dish needed a little more spice, but I liked the delicate flavours of the terrine. And we both agreed that we really loved the Mini Sweet Paprika Chorizo! This was our third Light Bite, and definitely our favourite. The plump little chorizo sausages were packed full of flavour, and covered in a sticky honey glaze. I would happily have snaffled all of these myself! Each of the Light Bites is matched on the menu with a beer, and you can order three Light Bites with a beer flight of their suggested pairings. It’s definitely a great way to sample the menu! As well as their amazing choice of beers, the Head of Steam also serves a wide selection of wines, soft drinks, spirits and cocktails. And while we waited for our main courses to arrive, I was presented with this pretty drink. It’s called a Pink Elephant, and is one of a small range of beer-based cocktails available in the bar. Tanqueray gin, triple sec, lime and pineapple are mixed with a splash of Delirium Tremens, which is a Belgian cherry beer. It tastes sweet, fruity and very delicious, but it definitely has a bit of a kick! I enjoyed the flavour of the drink and loved the presentation, but decided that I’d better stick to beer for this evening. Before long, our main courses turned up. The menu includes everything from pizzas and hot dogs, to pie and mash, and a selection of world foods. There are a few vegetarian options on the menu, and I was very tempted to go for the Crispy Halloumi and Guacamole Burger. And the Spiced Cauliflower, Lentil and Spinach Pie would have been a great choice on a cold day, served with mash, mushy peas and gravy. Mark felt that he really needed to try out the Full Head of Steam burger. Two 4oz beef and chilli patties are topped with onion rings, smoked bacon, Monterrey Jack, and onion jam, all served in a soft brioche bun. It was a bit messy to pick up and eat, but the flavour and texture of the burger was excellent. We’d asked for sweet potato fries with Mark’s burger, and they were great as well – very crisp and full of flavour. I’d opted for the fish and chips, mainly because they are accompanied by a side of wasabi pea puree, which sounded intriguing. The generous portion of fish was encased in light crisp Brooklyn beer batter, and was presented on top of a pile of really good skin-on chips. They were somewhere between chunky chips and skinny fries, and had a satisfying crunch. The peas were a little bit underwhelming, with more warmth than heat from the wasabi. But I suspect that it’s a difficult balance to strike – after all, what’s underwhelming for one might be overbearing for another. Mark asked for a second bottle of the Jupiler 0% with his main course, while I pored over the drinks menu to decide on my second beer of the evening. I eventually decided on a bottle of Anchor California Lager, which is an all-malt lager with a golden colour and smooth flavour. I really enjoyed this beer, and I’ve since discovered that it’s available in my local supermarket! Yet again, we found ourselves too full for pudding. The Head of Steam has a small dessert menu, including a tempting Salted Caramel and Chocolate Torte, which I’m definitely trying next time. We thoroughly enjoyed our evening at the Head of Steam. The bar itself looks fantastic, and really stands out with its industrial-inspired styling. The food we ate was delicious, and the bar staff couldn’t have been more friendly or helpful. I was really impressed by their knowledge of what is definitely a very wide selection of beers. Our meal was complimentary, but ordinarily the bill would have come to £56.70 for 3 shared starters, 2 main courses, and 2 rounds of drinks. I think that’s a very reasonable price, considering the quality of the food and drink, and the generous size of the portions. We definitely plan to return to the Head of Steam, and I think it will be an excellent place to take our teenage sons for dinner when we’re in town. It’s also perfectly placed for a mid-week dinner after work, before getting the train home to Shropshire. Thank you to the Head of Steam Birmingham for a fantastic evening!